Samuel L. Clemens, primarily known as Mark Twain, was a successful author, journalist, satirist, and lecturer. He was born in Florida, Missouri, the third of five children, on November 30, 1835. His life was neither ordinary nor predictable, leading Clemens from a printing job in Hannibal, Missouri to an apprenticeship on a Mississippi riverboat, and later, to the Nevada and California territories. By the 1860s, under the pen name “Mark Twain,” Clemens had established himself as a respected and admired author. His social respectability increased after his marriage to Olivia Langdon in 1870, daughter of a wealthy coal businessman. Mark Twain’s Mississippi boyhood was a prolific source of inspiration for him, eventually leading to The Adventures of Tom Sawyer (1876) and The Adventures of Huckleberry Finn (1883), two of his most popular novels. The timelessness and flexibility of his ideas and writing has instructed and inspired people from every generation for over a century. Twain incorporates themes like adventure and travel into his narratives, but he also expresses an interest in satire, directing it against both arrogant Europeans and pretentious Americans. The Man That Corrupted Hadleyburg (1899) and The Million Pound Bank Note (1893) are both examples of the satirical flame burning through Twain’s writing. Twain wrote in many genres, employing themes like racial identity, European and American imperialism, dream life versus “real” life, morality, innocence, and freedom, and he was a master of language, earning a reputation as a magician of words. By the end of his life, Twain was publicly revered and his opinions were sought on every subject of general interest, but he was deeply disillusioned by humanity, angered by the profound inequality of life. Twain’s despair was, in part, fueled by a series of unfortunate events that took place in the later years of his life, beginning with the death of his oldest daughter, Susy. 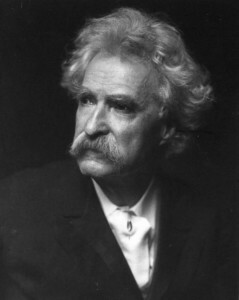 Twain died from a heart attack on April 21, 1910 at age seventy-four. Mark Twain. Digital image. Wikipedia. N.p., 1 Sept. 2010. Web. 1 Dec. 2015 <https://upload.wikimedia.org/wikipedia/commons/e/ef/Mark_Twain_life_1900s.pg>. “Samuel L. Clemens.” The Heath Anthology of American Literature. 5th ed. Eds. Paul Lauter and Richard Yarborough. Vol. C. Boston: Houghton Mifflin Co., 2006. 232-35. Print. “Samuel L. Clemens.” The Norton Anthology of American Literature. 6th ed. Ed. Nina Baym. Vol. C. New York: W.W. Norton, 2003. 56 – 58. Print. The Open Anthology of Earlier American Literature: A PSU-Based Project by Janina Misiewicz is licensed under a Creative Commons Attribution 4.0 International License, except where otherwise noted.